5-Year Plan For This Blog | Let's Live Forever! 2008 was a year for introducing bits and pieces of philosophy to puzzled bloggers and web searchers, that hopefully more or less covered the basic concepts of living forever in our bodies. As 2008 was last year, including it in this plan technically makes the plan a 4-year one, I suppose. Oh well… “5-Year Plan” sounds better. In 2009, I will continue to be introducing the concept of doing away with death, and making suggestions for how it can be achieved (i.e. healing methods). I’d also like to start involving other people more. I’m hoping to find other immortalists who might enjoy being interviewed, or having their work showcased. They might even write a guest post! There are a few well-known teachers in the physical immortality field—perhaps they might like to be involved. I’ll be introducing some of them this year if it feels appropriate. I’d love it if some lurking immortalists came out of the woodwork to have their say on this topic, as well. Maybe I’ll start finding quite a few blogs about physical immortality. There are lots of websites out there, but to me, blogs have a much more human touch. I’ve found a couple of immortality blogs just recently, so maybe I’ll get my wish here. Perhaps I’ll get to write a guest post on one! • There might be lots of breakthroughs on anti-aging to report on. At the moment I’m not terribly interested in these—I tend to think that addressing whether people want to live on is more pertinent than discussing the medical means. Also, to be immortal in our bodies we need to avoid both accidents and being the victim of serious crime, as well as avoiding illness and aging, so I don’t think medical cures for aging, on their own, are the be-all-and-end-all in the quest for immortality. However, if there were some nifty cures for aging, it might change our expectations, resulting in longer life-spans. But then again, if we use these cures but don’t really want to live, we might just have more accidents. • There might be substantiated reports of immortals living among us—or very old people, anyway. I don’t know how we can prove the ages of these people, to those who understandably question them—people don’t come with growth rings like trees display, should one cut across them. Maybe there’ll be a way. • If it’s true that there are greater energies descending on planet Earth, and people are polarising between more extreme positions of love and fear (like I described in my post Is The World Getting Better Or Worse? ), then more of the fear-filled people might be dying—perhaps in dramatic, newsworthy fashion. Maybe we won’t have to tolerate ruthless dictators for much longer. Just a thought. There could be reports of hospital wards closing, because so few people are sick. Doctors and nurses might be out of work. There might be retraining programs for funeral parlour directors, because business has been dropping off dramatically. There could be counseling services set up for all the people who have made it their life’s mission to help the poor and needy, because there are no poor and needy people anymore, and they are feeling unwanted. By the end of 2012, everyone will be taking the idea of indefinite life spans totally for granted. They will be so into living in the present moment that the “bad old days”, when people died, will be a distant memory. There will be no call whatsoever for this blog, and I will take up gardening. Or I could start a blog about the exciting new developments in space travel. A fanciful 5-year plan, perhaps. Comments are most welcome, as always. I’d love to read book reviews of some of the literature in this field and interviews with the authors or others who can offer their thoughts. Although I don’t want to live forever in this body with all its ailments, I am also always interested in things that will help us stay young and active. I’m just stuck with the idea that at any minute, an accident affect take me (or my loved ones) and ruin all my plans in that direction. Also, as I’ve mentioned before, that my much-loved dogs have died, and dying is the only way I know of to have any chance, however small, of seeing them again. Wow, I don’t have a one month or even a one week plan for my blog so your 5 years has me bowing to you as the all knowing guru of blog planning. I do like your ideas and the positivity that you bring to this topic Robyn. I say if you can continue to inform and challenge as much as you have to date, then Let’s Live Forever could forseeably go on … well forever! I will definitely be interested to read your posts on physical immortality. The idea of doing away with death is foreign to me. I am increasingly amazed at the number of spa centers that have recently opened in Singapore, promising potential clients that they can reverse ageing. Are we becoming a nation that is obsessed with looking young? I wonder if it is the same phenomena elsewhere in the world. Any observations? @Vered – thankyou! Maybe we are all in on this plan? @Davina – I think that type of visualisation may have been something we did at the workshops I used to go to – I don’t remember exactly. Now that’s a thought, about my new blog! 😀 Did you like my spaceships? @Marelisa – I hope you like it then! @Kelly – yes that’s me (she says knowing she only plans a few days ahead and was faking it). Thanks, Kelly. @Evelyn – I see the obsession with looking young two ways, I guess. One is that it can come from people being afraid of showing who they really are – a person comfortable with themselves doesn’t have to rush around getting fake tans and plastic surgery and so on. Because this comes from fear, it is distasteful to many of us. The other is that maybe when we try to look as youthful as possible, it’s because part of us knows that being youthful is the way we are meant to be – physical aging somehow doesn’t truly make sense. What an interesting topic. I love your photo espccially your hair! I want to live long only if I can be healthy! I’m a runner and eat healthy at 54 so far so good! Another question … do you think that blogging will be around in 5 years or will it morph into people video blogging like their own little video/tv vinyettes of their lives, loves, passions, stories? Oh me Robin. I thought I was doing good to make a change with my blog and focus on one year. This is great. I can’t wait to see how you evolve with this. I will be around….I’m sure! Cricket (A Day to Share with Tammy)s last blog post..Who would I rather be? I got all upset thinking that a fellow non-planner was actually mapping out 5, um 4 years worth of blogs. You had me suckered right in. Then I went “Wait a minute” and felt all better again. Actually, I love your plan. Here’s to it coming to fruition. @Tess – hi there and welcome! We would definitely want to be healthy if we were going to stick around, I think! I’m your age – and I need to get fitter – I’m working on it. @Jenny – I’m gald you like it! @8 women – welcome to all 8 of you! Blogging is already like that, isn’t it? It’s a great alternative to TV, I reckon. @Tammy – it’s an exciting time to be alive, I think – to see what happens. I love your cricket! @Urban Panther – ha ha – gotcha. And yes, here’s to it! Robin, from the very beginning I’ve been inspired by your no limit style and your quirkiness. It’s an honor to read another all the way authentic soul. By all means, yes, take up gardening in 5 years, but please keep your blog going too, so we can still see your pictures and get your thoughts on things? Just an outstanding post, Robin. I’m so glad you’ll be around for at least another 5 in cyberspace. I have to say that reading about 2012 made me smile..! Rosss last blog post..New E-Book: Jump-Start Change! @Tarek – welcome, and greetings to you too, Tarek. @Tom – who me? Quirky? Nah. I think the message you are spreading, about being authentic and having work that is delightful to us, is very important for a great many people. @Jannie – if you saw the state of our garden you might think I need to get onto it a bit sooner – we have a friend mowing the lawn right now. I wonder what form cyberspace will take in 5 years! @Ross – hi there Ross – ha ha – don’t you? I’m glad you liked the possibilities. robin this is a great idea. it makes you and me feel good to see it on paper. i need to sit down myself and figure some things out. incorporate more of personal ME but not too much and add some more comedy. Naturals last blog post..You Know It’s Time To Give Up Blogging When…. I am amazed that you have a long-term plan. You are thinking ahead for this blog. Wow, you have got a sharp imagination Robin! Time flies and very soon the five years will be up. Can’t wait, sounds fascinating! Creating a 5-year plan is a very bold move. Do I dare plan for 5 years out? You are making me ponder where I want my blog to be in 5 years. Thanks for helping me dream big! I will however be flitting around the blogosphere for most of the time till then, so I will be seeing many of you in my travels. @Natural – I thought you already had a fair dollop of YOU and comedy in your blog, Natural! @Tikno – I think ahead a little, but I must admit my 5 year plan is more to do with how I’d like to see the world turn out. @Sharon – 5 years may well come quite quickly – I’m glad you find it interesting! @Stacey – It doesn’t hurt to dream big, does it?! “Or I could start a blog about the exciting new developments in space travel.” — I’d like that, too! You know I’m a big Sci Fi fan, right? Loved this post! I saw the title and went “Whoa! Somebody’s a forward thinker!” and as I read I started smiling, but you know what? I finished the post still thinking “Somebody’s a forward thinker!” Great job. I bet it put smiles on a lot of faces. @SpaceAgeSage – Hi Lori – I wonder where our interest in sci-fi comes from – something to do with our destiny? @Daphne – Hi there Daphne and welcome! I bet you put smiles on a few faces with your ‘Joyful Days’. Cheers! very creative your 5 year plan. Were you inspired by 5 years plan like in the former soviet union? Or is it more a strategic business plan? However it is fun to red the plan….Well done..
Hi I’ve just arrived and I’m not exactly sure how I got here. Anyway, what I have seen here so far is very fascinating and I think I’ll definetly have to keep in touch. Love to read what my fellow Aussies are thinking. 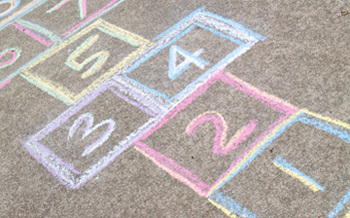 ps i love the drawing of the hopscotch – ( what an odd word……..sounds funny when you say it out loud ) not sure Ive got that right ! Loved your five year plan!!! I’m looking forward very much to the day funeral directors need to be re-trained – PARTY TIME!!!! ARE YOU A COSMIC SCRIPTWRTER? With Physical Immortality we are moving from the Spiritual Law of Karma to the Law of Grace. The Law of Karma – “As we sow so shall we reap”, “An eye for an eye a tooth for a tooth”. This law of cause and effect has created much hatred, resentment and retribution which has led to pain, suffering and death. By using the energies of forgiveness/gratitude, praise and love we transcend the Karmic Law and move into a State of Grace. We are cosmic script writers – with Karma we create murder mysteries, war and horror movies, soap opera’s and emotional dramas of the highest order. With Grace – romantic comedies, enchantment movies, travel adventures and musicals become popular. Are we over the ‘physical death’ script?? Review your own cosmic script, maybe it needs a rewrite! @ribbon – hi there and welcome! Your name bears a resemblance to mine! It’s funny how some words look funny written down. @Janni – Hi there and welcome to you too! Glad you liked it – and yes, let’s have a party! It’s great to hear from someone else who is into immortality – and thanks for your piece on karma and grace! Hi Robin – these are bold plans. I’m betting you won’t put those doctors and nurses out of business though. Getting people to live forever is one thing but eradicating stupidity is another. I’ve been wondering about that. Do you think folk will still die in fatal accidents and such? Or will we be able to avoid those things altogether, or heal ourselves from them? Hi Cath – the idea is that accidents and being a victim of war and crime are things we actually draw to ourselves with our feelings and unconscious mind. If we cause something, we can un-cause it, so as we become more conscious they won’t happen (as you suggest in your last sentence). This issue is the reason why I’m not personally all that interested in medical breakthroughs in reversing aging – we need to heal ourselves on the inside if we are going to become immortal. Hi there Doug! Great to hear from you – you guys are coming out of the woodwork (from my perspective) thick and fast! I had a look at your http://www.physical-immortality-now.com/ site – I like the way you see physical immortality as something that brings people together – after all, we are all one, anyway, so anything that involves expansion of cosciousness would be something we are all in together. I disagree about never going to other dimensions – my take on it is that on becoming self-realised we would have a choice about where we prefer to hang out – that is, there may well be comings and goings, out of choice. I also looked at the People Unlimited site you mentioned – I went to an evening with James Strole, Charles Paul Brown and Bernadeane in Melbourne in the late 80s! I agree with your comments about teachers – I put it that way to be brief. I meant people who write and speak about it, really. Cheers Doug!